I’ve always been intrigued by the numbers station concept: a short-wave radio station broadcasting apparently random streams of numbers, supposedly coded messages by various intelligence services to their agents in the field. It’s a rare glimpse afforded the public, of the world behind the spy curtain. It’s the basis for this thriller, though the idea is more a foundation than the focus. CIA assassin Emerson Kent fails to tidy up the loose ends after a hit, refusing to kill a young girl – his boss (Liam Cunningham) has to cover for him, and Emerson is taken off active duty until he gets his head straight. 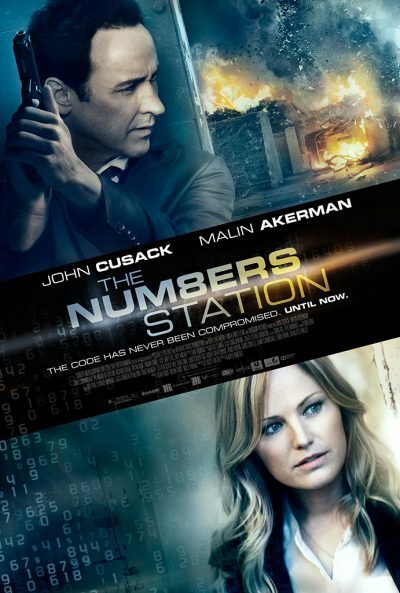 He is reassigned as security at a numbers station in Suffolk, where he works alongside Katherine (Åkerman), a specialist who generates the coded transmissions and broadcasts them. It’s a dull existence, until one morning, when they turn up to relieve their colleagues, only to find the station under siege from persons unknown. While they’re able to get in, that’s only the start of their issues, as it becomes clear their unknown attackers have used the numbers station to send out messages with unauthorized orders. So, as well as seeking help and defending against the assailants, they have to figure out how to recall those commands. The claustrophobic setting of a disused (and largely deserted) military base is effective, but the rest of the film is just too obtuse with regard to what’s going on. Who, exactly, are the attackers? What are they attempting to execute with their coded orders? These, you would think, are significant and important details, yet the movie does little to address them, beyond a handful of scattered, vague hints. It doesn’t help much that the basic, cryptographic concept of the numbers station is not exactly the stuff of cinema: Barfoed does his best to jazz things up with whizzy shots of computer displays and stuff, yet there’s only so far this can take you. Cusack is solid enough; at times I felt this was some kind of prequel to Grosse Point Blank, explaining how his character there moved into the private assassination sector. There’s also something of Jennifer Jason Leigh about Åkerman: she brings a credibly intellectual quality to her role. Between them, they keep this watchable enough, even when the unfolding of the various story-line elements have largely given up that fight. There’s no surprises at the final outcome, which has more or less been telegraphed from the opening ten minutes. The moral issues which could have been at the heart of the film (is it ever alright for a government to target its own citizens for assassination?) are almost entirely ignored, in favor of Cusack running around looking serious. At least this is wisely kept under 90 minutes, and the decent central performances allow it just about to hold interest for that long.